Another clothing retailer brand Sapphire Textiles has launched its coveted lawn collection 2016 that is ideal for spring summer season. This collection is now accessible in its all leading boutiques and outlets from 29th February onward. This lawn collection by Sapphire is a combination of the signature Sapphire floral contrasts, pastel hues, decadent spirit of the prismatic geometry and opulent fabrics. Sapphire Spring Summer Lawn Collection 2016 is a synthesis of modern and ethnic silhouettes and cuts along with the influences from the Victorian, Chinese and Oriental detailing. 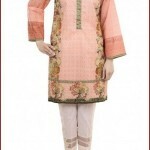 The color combinations are inspired from the pastels of prismatic that offers twenty adorable designs which comes in 2 color, including four piece, three piece and two piece suits. 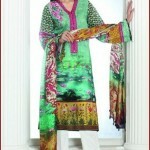 Even the prices of all these suits of Sapphire Lawn Collection range from Pakistani Rupees 1,650 to 6,300/-. This brand also deals in jewelry, clothing as well as accessories which are liked by everyone and they also appreciate its work. The originality of these suits style, quality stuff, embroidered patterns and material has been made by this designer by its own. Khadija Shah, the designer of this brand Sapphire who is going to introduce intricate floral prints and designs which are ideal wear for summer hot season. Extra color combinations are garnished with captivating designs and different embellished threads which gives these suits an outstanding look. 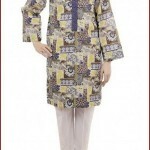 The designer has introduced the awesome prints along with the techniques of modern printing. In this collection, all shirts are done with different embroidery work along with flowering chiffon dupattas and some dupattas are available in the format of digital prints. I hope this collection of Lawn by Sapphire will be liked by young girls because each suit has its own appearance and look. 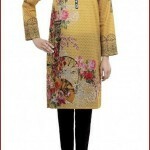 For more details, anyone can visit to its official webpage and enjoy the latest dresses of summer. 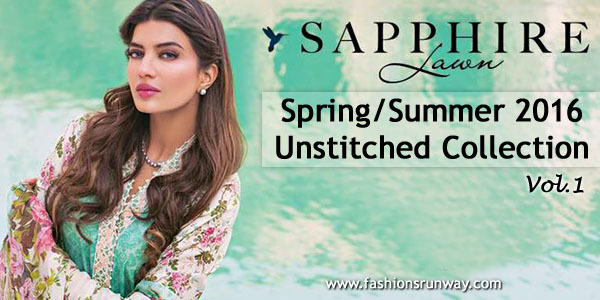 Check below here all designs of Sapphire spring summer unstitched lawn collection 2016 for women.